Darius I, King of Persia, claims to have accomplished many deeds in the early years of his reign, but was one of them the rebuilding of the temple in Jerusalem? The editor who added the date to the books of Haggai and Zechariah thought so, and the author of Ezra 1-6 then relied on his dates when writing his account of the rebuilding process. The genealogical information contained in the book of Nehemiah, however, suggests otherwise; it indicates that Zerubbabel and Nehemiah were either contemporaries, or a generation apart in age, not some 65 years apart. Thus, either Zerubabbel and the temple rebuilding needs to be moved to the reign of Artaxerxes I, or Nehemiah and the rebuilding of the city walls needs to be moved to the reign of Darius I. In this ground-breaking volume, the argument is made that the temple was built during the reign of Artaxerxes I. The editor of Haggai and Zechariah mistakenly set the event under Darius I because he was influenced by both a desire to show the fulfillment of inherited prophecy and by Darius widely circulated autobiography of his rise to power. In light of the settlement patterns in Yehud during the Persian period, it is proposed that Artaxerxes I instituted a master plan to incorporate Yehud into the Persian road, postal, and military systems. 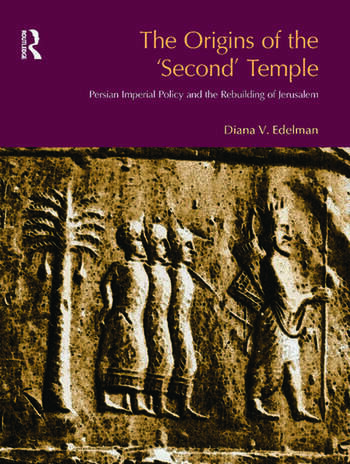 The rebuilding of the temple was a minor part of the larger plan that provided soldiers stationed in the fortress in Jerusalem and civilians living in the new provincial seat with a place to worship their native god while also providing a place to store taxes and monies collected on behalf of the Persian administration. Diana Edelman is a senior lecturer in the Department of Biblical Studies at the University of Sheffield.